One benefit of cast iron is that the seasoned surface is naturally nonstick and non-toxic at any temperature, unlike bonded surfaces like Teflon. How Green is Our Foundry? *Increased Use of Biodiesel:* In 2005, Lodge began using biodiesel to power several pieces of equipment, progressing to a 90% blend before cutting back to 20% in winter months. Biodiesel reduces ozone forming potential and also reduces emissions of sulfur, carbon monoxide, particulate matter and hydrocarbons compared to diesel. *Cardboard Recycling:* Lodge began cardboard recycling by allowing outside companies to pick up cardboard at no charge. In 2001, the amount of cardboard recycle was 34.5 tons. In 2005, it was 48.1 tons. The program continues today. *Establishment of Beneficial Use of Foundry Sand:* Lodge Mfg, the American Foundry Society (AFS), and the Environmental Committee of the AFS worked with the Tennessee Department of Environment and Conservation’s Division of Solid Waste to request and help draft a beneficial use policy for non-hazardous foundry sand. The policy was adopted in April 1996 and is an example of industry and government working together for good of the environment. Beneficial Reuse of Foundry Sand/Marion County Landfill: Lodge Mfg coordinated with Marion County government to have 9,225 cubic yards of foundry sand to create the required 12-inch protective cover over the liner in the first phase of two new cells. Completed in March 2003, the County saved $191,311.75 by using the sand. *Settling Ponds Support Plant & Animal Life:* A stream flows from South Pittsburg Mountain through the Lodge foundry and into the Lake Guntersville Reservoir Watershed. Working to enhance the stream’s water, Lodge constructed three storm water settling ponds to support plant and animal life. Water lilies, cattails and fish have been introduced to the ponds and are thriving. Water quality is now above requirements. *Planting Trees for Site Beautification & Ozone Attainment:* A total of 121 trees have been planted on the Lodge Mfg campus to help improve air quality and beautification. The establishment of 1.4 acres of trees is equivalent to removing one motor vehicle from the highway. *Lodge Manufacturing receives the 1994 Governor’s Award for Excellence in Hazardous Waste Reduction:* In 1991, Lodge President Henry Lodge replaces the cupola melting system with more environmentally friendly induction melt system. The result was that Lodge Mfg changed its status as a Large Quantity Generator of Hazardous Waste to Small Quantity Generator. Fissler cookware has me racing to, and through, the kitchen. Their German precision engineering has cooked up some radically efficient features, saving time for the cook and fuel for the planet. If you want to be a greener gourmet, take a look at the energy-saving aspects of these Fissler pieces, and while the cost is high-end, these pieces should deliver a lifetime of quality for the price. Smart, Solid Base: Starting from the ground up, Fissler’s proprietary CookStar base integrates nifty energy-efficient aspects, while enhancing the cooking performance on all types of cooktops, including induction. The CookStar base is slightly concave when cool so that it lies perfectly flat when heated, maximizing the contact between pot base and heat source, thus saving energy. Plus, the super-conductive, extra-thick base heats up quickly and retains heat so well, you can turn the burner down (or off) early and let residual heat in the base finish the cooking. Like a bridge, the base features expansion joints, and consists of stainless steel and aluminum bonded by 1500 tons of heated pressure into one single unit (not triple layers as in other cookware), with no hot spots, so it’s guaranteed never to warp and to stay flat on any type of stove forever. 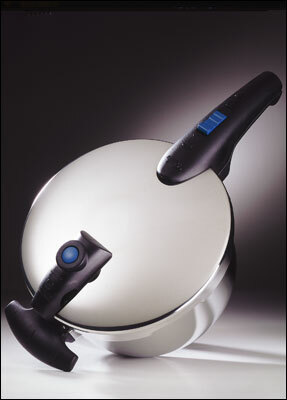 The Cookstar base is built into most of their new cookware, including the items below. 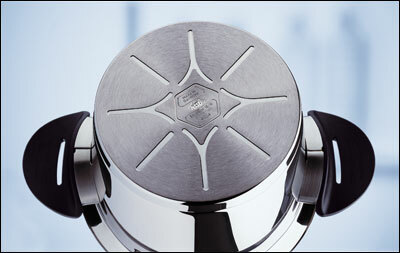 The Intensa Investment: Fissler designed their Intensa cookware (also with the CookStar base) with unique, efficient features not found in other pots. The lids feature a “ThermoStar” temperature indicator, which turns completely red when the boiling point is reached and partially red when liquids are near boiling (good for low-water, lid-on cooking and simmering). Keeping the lids on helps minimize heat loss, maximize nutrition, and lessens fuel consumption. That’s not all though. Turn the lid ninety degrees in one direction and the pot’s completely sealed. Turn it back and you can pour out liquids with the lid on, using the gently curved rims of the pot. And you don’t need potholders to do it, given the stay-cool handles. 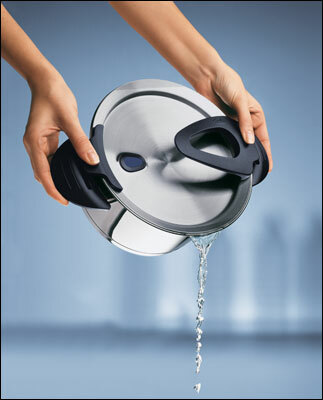 The handle on the lid is big, comfortable and open (see the picture), so you can grasp it with your whole hand. Okay, I was more than adequately impressed at this point. Then I discovered that the side handles function as lid holders, too, and the underside of the lids are conical, so condensed liquids drip back into the pot. (No more messy drips from a hot lid, or searching for a place to rest it.) Other details, like stackability and measuring levels (in liters) no doubt helped this cookware win multiple awards for design. I use their stewpot and stovetop casserole pots almost every day now, and they also make saucepans and lower-depth serving pans with the same Intensa features. A Crisp Idea in Fry Pans: Perhaps the most frequently used pan in the kitchen is the skillet, and the German ingenuity in Fissler’s Crispy Steelux Frypan makes it cool to look at and a hot piece of cookware. Again, it’s got the CookStar base so it heats up quickly and holds heat evenly. The interior has a thick honeycomb texture, so you can fry/pan-grill foods with no or little oil. When I cooked salmon in the skillet, the exterior was perfectly browned, and the skin was crispy-delicious. Optional Equipment: Fissler makes a nifty splatter shield (usable on all size skillets), that mounts upright on their skillet handles, while you’re peeking or turning the food. It’s handy and less messy than standard splatter guards. Their glass lids let you view food as it cooks, and come with stay-cool handles, so no pot-holder required. Fissler’s proprietary Protectal Plus is extremely hard because of its ingredients (ceramic, titanium, and microparticles), and durable because the way the coating is applied and bonded (pretreatment, three-layer composition, and pressure). Competitor models may only use two layers of sealing on a smooth pan surface, and many sealings do not have the microparticles that permit a longer, more effective nonstick lifespan. Ceramic and titanium are present in only the highest-quality coatings, and Fissler’s application technique and proprietary blends of materials set us apart from our competition. Protectal Plus won the highest rating as the strongest nonstick coating from the Stiftung Warentest testing body in Germany (comparable to Consumer Reports in the United States).This translates into better nonstick properties for a longer period of time. Even if the consumer scratches one of these pans, the surface damage is minimized because of the pretreating technique and the hardeners in the coating formula (it will not peel). 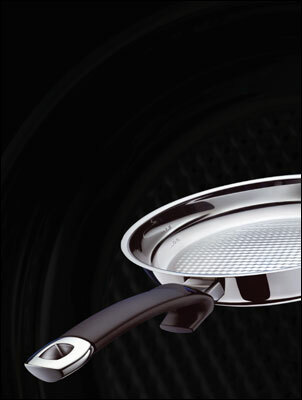 Protectal Plus is not a DuPont product, and is present only in Fissler pans; it contains PTFE (Polytetrafluoroethylene), but is not unsafe, does not release toxins unless heated to 700 degrees Fahrenheit, and is also not digestable by the human body, so if the user manages to remove small amounts of coating through harsh use, the substance will simply be passed through the body. We guarantee that there will be no chipping or peeling for 5 years of use. Bottom line: Consumers who want a premium nonstick product, that diffuses heat evenly, will last a long time, and is less susceptible to damage, then they’ve found a solution in Fissler’s pans sealed with Protectal Plus. One last word: Fissler’s Steelux skillet handles stay cool, but can only withstand oven temperatures up to 285 degrees F (okay for warming drawers but not ovens or broilers). If you need a skillet for oven use, I suggest augmenting these with a Lodge cast-iron skillet. Though pro kitchens (and TV shows) have used it for some time, induction cooking is just now entering the high-end consumer kitchen, and Viking is, not surprisingly, a brand leading the way. I’m not ready to jump into a whole cooktop powered by induction (can’t afford it, and as a foodwriter, I need to test recipes on all types of fuel using all types of cookware). 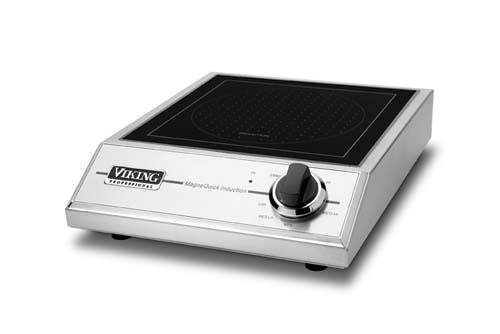 But from an energy-efficiency perspective, I can’t pass up Viking’s alternative: the portable induction cooker. Basically, induction cooking works by sending a magnetic field (generated by the cooker) through ferrous metal (as in cookware made of cast iron, steel, or other combination that is magnetically reactive). The reaction creates heat, and it’s this heat that cooks the food. The heat is created from within the pan’s own material; think friction and fast-moving, excited molecules (like the heat generated between your hands when you rub your palms together). The result: a near instant transfer of energy, with efficient absorption of over 90 percent of this energy (compared to around 50 percent efficiency with gas). Plus, the cooker’s surface stays cool, very little heat is released into the kitchen, and the food can actually cook quicker. Since the cooker surface stays cool, absorbing heat only from the cooking vessel, it’s easy to clean (no cooked on muck). Plus, with this nifty portable unit, I can cook anywhere there’s a plug. Like out on our wide Texas deck, in fresh air, with grazing deer and wild turkeys watching. 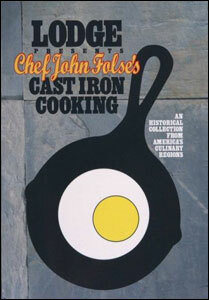 The first time I boiled pasta (using a Fissler Intensa pot) or fried steaks (in a Lodge cast-iron chef’s pan) on the induction element, I noticed the differences from conventional electric or gas cooking right off the bat. The water boiled sooner, and the fry pan reached perfect searing heat in a flash. Plus, I had instant control; when I turned the dial from high to low, the unit powered down to the lower setting immediately (essentially adjusting the strength of the magnetic field). No waiting for a hot gas or electric element to slug down in speed. And you can maintain constant simmering and very low temperatures (good for chocolate) better with induction. When it comes to getting the cook up to speed, induction cooking doesn’t demand anything in the way of a learning curve. At least not like microwave ovens or the dual-fuel ovens that combine radiant heat with microwave cooking. If you can boil water on a gas or electric range, you can cook with induction. But be aware that not all cookware is induction-compatible. I’ll be exploring faster, better ways to cook using induction as I research my upcoming book, New Green Basics, and will post progress here as time goes on. Viking’s portable induction cooker runs around $500, but I expect all induction units will come down in price as they become more popular with the luxury set. But for those who can’t wait, and want to trade up in energy efficiency now, this handy unit brings both fun and fuel-savings to the home kitchen, in a compact package you can carry in one arm. With Rising Sun Farms Tortas, you’ll shine as the perfect gourmet, and stress-free, host. Simply grab one of these layered cheese tortas from the freezer, pop it out of the container to thaw, and serve with crackers or breads, or melt into a sauce. Our personal picks: award-winning Pesto Dried Tomato Cheese Torta and Cranberry Orange Cheese Torta. Though we’ve not sampled them, gorgonzola, artichoke-lemon, key lime, and other flavors fill their torta line. 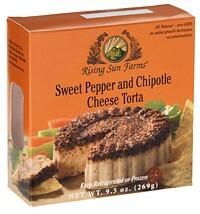 They’re available nationwide (see risingsunfarms.com for retailers and products; Texans can find exclusive Southwestern-seasoned tortas at Central Market stores). Rising Sun Farms products, made in Oregon, are better than organic. Their story dates back to the 1980s, when the couple started growing organic herbs. Today, their products are so “clean” that they’ve been exporting them to Japan, surpassing the stringent preservative- and additive-free import standards for nine years. According to the company: “In 1992 Rising Sun Farms found it necessary to go beyond organic certification to meet personal and corporate missions to always insure the highest quality products.” An independent laboratory tests every ingredient for chemical and pesticide residues, their dairy suppliers certify their ingredients are rBGH free, and they have a no GMO policy. Any ingredient that fails any of the testing is not used. Maybe that’s why their tortas taste so fresh and good. Loofah: Cleans Good, Tastes Great! October 16, 2007 by Kate Heyhoe · Comments Off on Loofah: Cleans Good, Tastes Great! I used to buy these crazy looking squashes in Asian markets decades ago, long before I knew what they were. They’re long, deep green, with ridges all around the outside, and kind of spongy inside, so they sop up sauces readily and have a pleasant springy texture. I later realized these loofah squashes are the fresh versions of the loofah sponges used for bathing, and now for dishwashing and vegetable scrubbing. 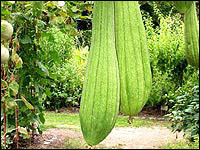 Also known as luffa or luffah, the loofah is ecologically greener than natural sponges, which are harvested from the ocean and in some places, running scarce. They’re also more sustainable than cellulose sponges, which are manufactured from wood. I’ve seen loofah kitchen sponges in colorful shapes (red chile peppers, from Loofah-Art), and in natural straw color. They’re easy to grow, too, and some backyard gardeners split their loofah harvests between edible veggies and drying as sponges. Cook up *Stir-Fried Luffah with Diced Shrimp and Garlic* and read details about loofah at Global Gourmet’s page on *Luffah Squash*. 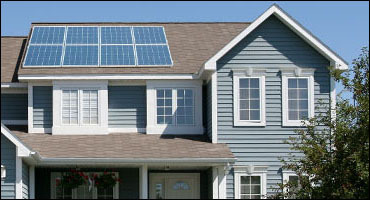 Here’s an innovative concept: Solar Leasing. This company will, starting in 2008, lease solar home systems, maintain them, and install them (with no upfront costs) for the same price as what you pay for electricity now. It’s called the Citizenrē REnU program. Watch a video with Ed Begley, and check out the basic info “here”:http://www.liveearthsolar.com/. Essentially, you pay to Citizenrē what you would normally pay to your existing electricity supplier during the lease term, which runs in one, five and thirty year increments. But you lock in the rate at the beginning of each term, so even if your electric company raises its rates during the same period, you’re not affected. Plus, you stay on the grid in case the solar system fails or runs low on solar reserves. It sounds like a winning concept for the environment (no greenhouse gases from solar energy), and for the consumer (no rate increases, no purchase or installation costs, or maintenance issues for what would otherwise be a very costly venture). The company is taking orders now for launch in 2008. It sounds great, but I haven’t read all the fine print and am always cautious about working with a company that’s still tweaking their operations and their local installers (especially since we live in a rural area).